A sneaky feeling that I was about to come down with something caught me off guard on Saturday. Something unpleasant enough to be energy zapping without making me bed ridden. Just days earlier my husband had been under the weather and his symptoms started with a tickle in his throat. Exactly the kind of tickle I woke up with. Slightly anxious about how the weekend would unfold I immediately thought about nourishing my body to help my immune system fight off what ever bugs were trying to take hold. In the words of the ancient Greek Physician Hippocrates “Let food be thy medicine and medicine be thy food”. The immune system is often referred to as a highly trained military ready to defend your body against the bad guys. But to operate at it’s best it needs an anti-inflammatory diet. Luckily for me an anti-inflammatory packed pickle was brewing in the fridge. A pickle my husband had whipped up just a few days earlier and one I’m now convinced would be useful in any (refrigerated) medicine cupboard. Turmeric: a compound called curcumin give this spice massive immune promoting properties. Ginger: contains an anti-inflammatory compound called gingerol. Garlic: when chewed or crushed raw garlic produces an immune boosting compound called allicin. 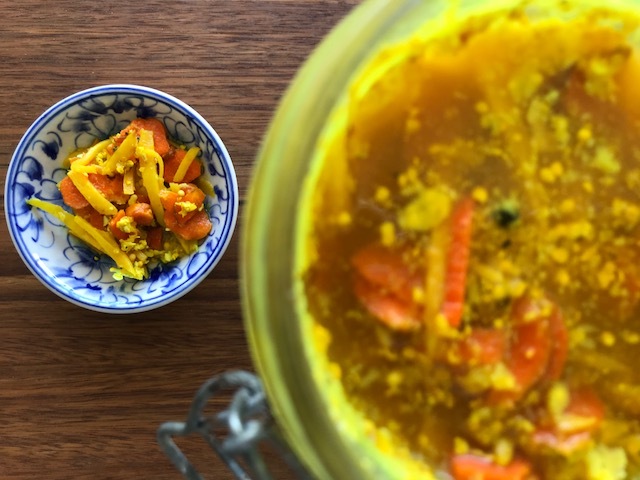 I got excited about turmeric pickle after seeing a recipe from a fellow blogger Annika – who has a lovely food and photography site called conifères & feuillus. 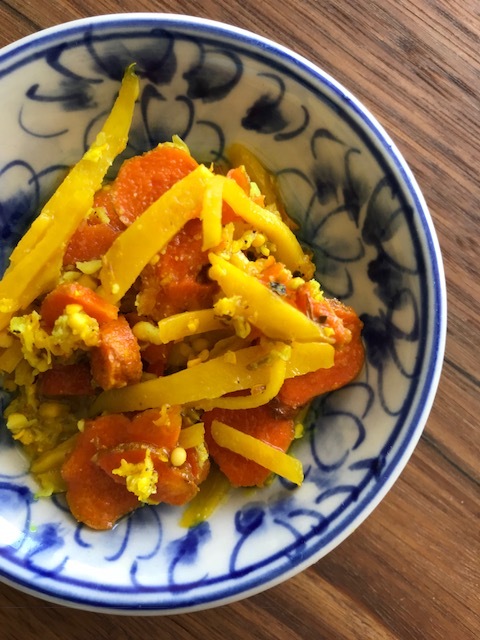 I knew my husband would be equally excited due to turmeric pickle – or kachchi haldi ka achar – being a specialty of Gujarat – the Indian province that his father comes from. When I shared Annika’s post he recalled vivid childhood memories of his father enjoying it as a condiment with every meal. Wind forwards 20 years and with the healing power of turmeric in mind making this was a must do – right now. Crush the raw garlic, black peppercorns and fennel seeds. Add the crushed mixture to a large bowl along with the lemon juice, coconut oil and salt. Wash and finely chop the ginger and turmeric. Smothering your non knife hand with coconut oil will to some extent protect against (inevitable) turmeric stains. Add the chopped ginger and turmeric to the bowl and give everything a good stir. Transfer to a sterilised glass jar. Allow to brew at room temperature for two days and then transfer to the fridge for a few weeks. Do you have any immune boosting foodie tips? If so I’d love to hear them. With Sydney’s Winter around the corner I may need more than this pickle to keep me safe…. 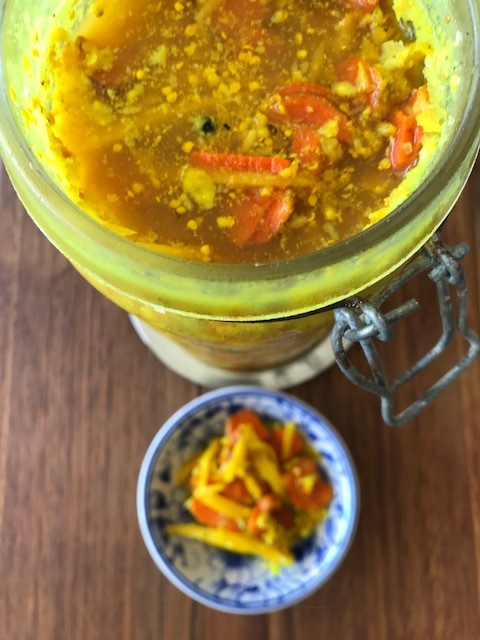 Tags: garlic, ginger, immune boosting, Indian, pickle, recipe, turmeric. Bookmark the permalink. Hello Laura! I hope you are feeling a bit better! The combination you used sounds really “virus killing”. So hopefully, it helped. I tend to have in fridge ginger syrup (https://withcoloursandcanitointhekitchen.blog/2017/04/28/first-blog-post/), even for the little one when we are getting sick or traditionally, layers of onion and honey in glass of very strong Czech spirit “slivovice”. Strong, sweet and very good remedy 🙂 Take care! Hi Vero, yes I’m feeling better, I do think the pickle and plenty of sleep saved me. Thank you for asking. And your soup looks fantastic – a keeper for the arrival of Winter for sure…..
Hi Laura, I am glad to hear you are better! 🙂 Take care! This looks so very delicious, on top of being so healthy. I hope spring will bring some good fresh turmeric so I can make this. Hi Ronit – I didn’t talk in my post about the flavour but you are right – it really is delicious and I can confess to eating it straight from the jar! 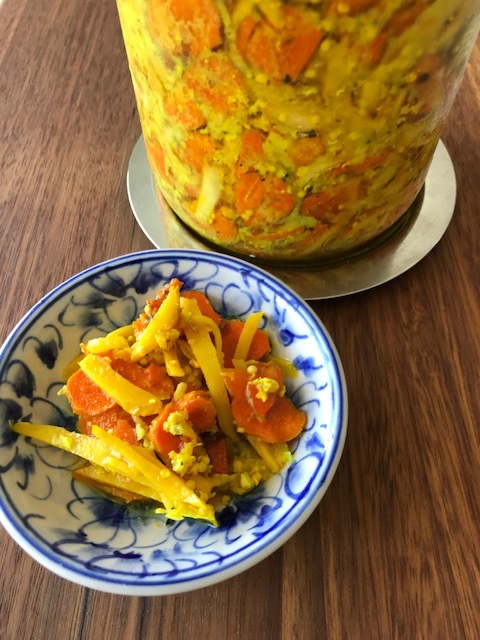 Hi Annika, as I said I have only you to thank for the inspiration – and also my husband who endured the turmeric stains and the aftermath of cleaning them! What has surprised me most is how genuinely tasty the pickle is….. This looks amazing, love this vibrant yellow pickle ! Whenever I hear the word immunity, my mind immediately takes me to amla (Indian gooseberries), you can also make amla pickle in the same method, but we make spicy amla pickle balancing the tanginess. Hi Megala – I’m so glad you like this pickle and I’m with you – anything that boosts my immunity I will happily devour. I’ll have to look out for Indian gooseberries – an ingredient I’m not familiar with. Thanks for stopping by. We enjoy making a turmeric tea, for when we feel out of sorts. Hot water, some freshly grated turmeric and lemon slices… really helps! Hope you feel better soon! Hi Helen and Billie – thanks for the feedback on turmeric tea – I’ve bought turmeric latte powder in the past but haven’t added fresh turmeric to tea – I’ll keep that idea to hand over Winter! Hi Sandhya – great idea to use this pickle as a dressing too – I’m so enjoying having a huge jar of it in the fridge to dip into most days! I also have some turmeric infused matcha tea – turmeric is everywhere! Great idea to have a jar of the pickle in the fridge Laura! Totally agree Sandhya – I’m trying to ensure I get a dose 3-4 times a week…..
Hello. I have had many GI issues in the past. Eating a small amount of this pickle with my meals has had tremendous benefits for me. I knew that ginger is good for digestion and turmeric is a great anti inflammatory. I was just looking for a good recipe and this is it. I also add celery seeds and black seeds to this recipe and use Himalayan Pink salt instead of regular salt. So glad you like this recipe and I too use Himalayan pink salt in all of my recipes!